HCM CITY (VNS) — HCM City plans to set up a special economic zone spread over the four districts of 7, Binh Chanh, Nha Be, and Can Gio to develop its maritime economy and logistics industry. The Development Research Institute of HCM City, which has provided the draft of the zone to the city administration, said the zone would spur the development of the area and create jobs and other livelihoods for local residents. 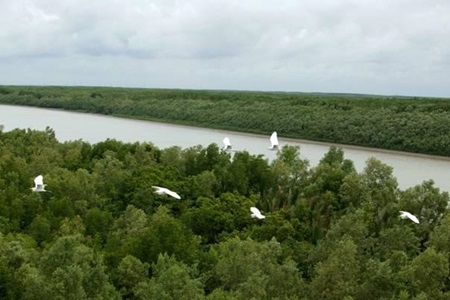 It also said it would promote tourism and help preserve the Can Gio Mangrove Biosphere Reserve and help develop the entire southern region. In a report, it said the establishment of the zone would help convert an inefficient agricultural area into a developed urban area. It would attract international investors and could be used to test new policies, it said. The zone will have 35sq.km and a population of 321,000 in District 7, 49sq.km and 125,000 people in Binh Chanh, 100sq.km and 163,000 people in Nha Be, and 704sq.km, half of which will be protective forest, and 77,000 people in Can Gio. The report also mentioned possible difficulties facing the construction process. Since the area is low–lying, it will require a huge investment. It has poor infrastructure, especially for vehicles, and will need at least 10 years to prove its effectiveness, meaning public pressure could mount for its success. The institute was hoping the draft plan would be approved in 2014-2015 by the HCM City Party Committee and People's Council. In 2016-18 final plans for the zone will be made and a search for strategic investors will start.